Collins English Dictionary defines it as a bag or case containing basic medical supplies that are designed to be used on someone who is injured or who suddenly becomes ill. Merriam-Webster, Oxford Dictionaries and even trusty old Wikipedia are of the same opinion. 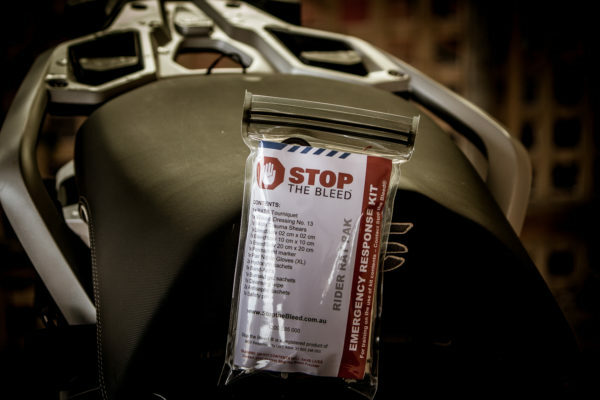 As a motorcyclist, we need to be prepared for the unthinkable and that means dissecting the typical First Aid Kit to find anything that may be useful in the event of a motorcycle accident. Lets start by using a quote from a very wise and good friend (LB) – “If you are Breathing and NOT Bleeding, then you are fine”. A friend may have had a small incident of any kind and you want to be the first to get your kit out and show it off. That right there is a great reason to have the best kit ever to reside on a motorcycle. It doesn’t matter what the problem is, your kit can fix it. So let’s make sure we have some bandaids, splinter probes (safety pin works well), wound wipes, burn gel and other shiny objects. You need to help yourself after an incident, but you are still breathing and not bleeding, or not bleeding bad. So this is where you may need a little more TLC with a larger bandage or some hydralyte to support that dehydration. The big one – you survived the worst of a bad day and hopefully your bike survived as well. But this type of accident needs some rapid intervention to make sure that you get back home to your loved ones. A person who is bleeding can die from blood loss within 3 to 5 minutes, therefore it is important to quickly stop the blood loss. 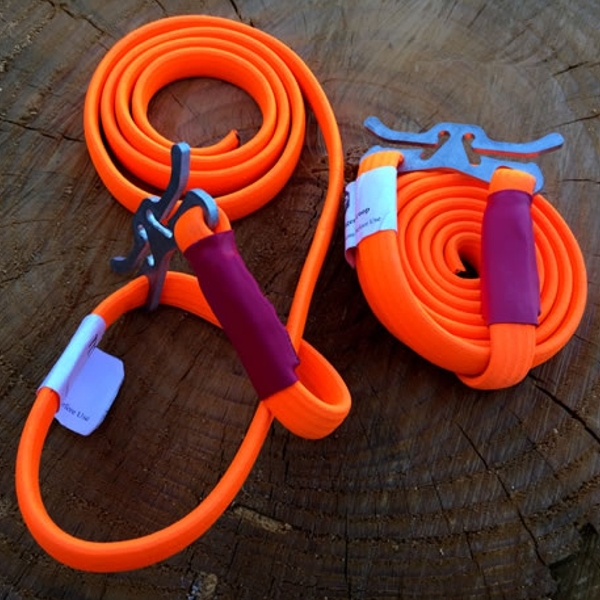 With an increase in heart rate after an accident, there will be an increase in blood loss, so it is critical that you can get to your First Aid Kit quickly and get the one thing that will save your life in those first minutes – a commercial tourniquet. We are not talking about an improvised tourniquet, those things have been proven that without a windlass, they have a 100% fail rate of stopping the bleed, and by the time you get everything together, it could very well be too late anyway. So lets hope that your kit has the one true thing that will save your life – a commercial tourniquet and just as important, that you have been trained well to use it. But what if the bleeding is in a location that a tourniquet can not manage, well that’s when you need a form of haemostatic dressing. Once again, training is critical to understand the use and application of haemostatic dressings. So let’s make sure our kit has haemostatic dressings (various sizes) and a commercial tourniquet, and just as important as those two lifesaving items, is the correct training on their use. Now that we have an idea of what we should have in our First Aid Kit to get us out of trouble with both the small stuff and with the life threatening injuries, let’s look at how much of each item should we carry and how big should our kit be. It would be fair to say that each of us will have different needs and space can be an issue, but we could all possibly agree that the smaller the kit the better. 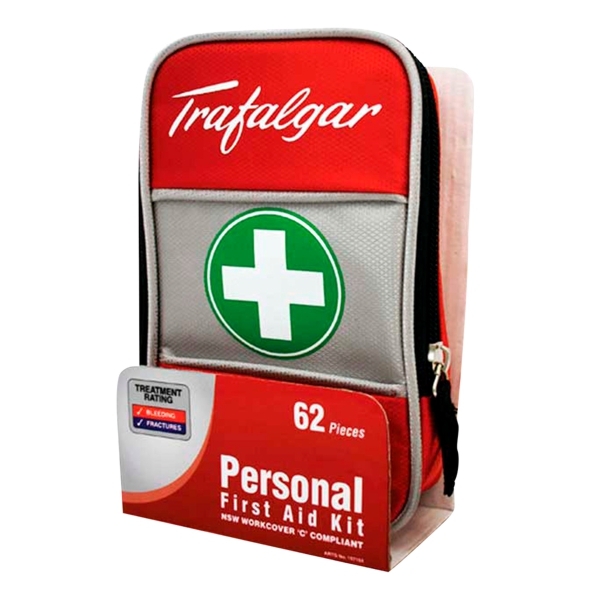 One of the better kits for size has to be the Trafalgar First Aid Kit. It is a great size kit that will even fit the large trauma shears (another must for the motorcyclist). You can buy them anywhere between $10 to $20 off the shelf, but be warned, there is not much on the inside that will be very useful to you. As with most first aid kits the Trafalgar is also full of bandaids and bandages. Always remember, bandages do nothing more than soak up blood or hold ‘stuff’ to your skin or limb, they DO NOT stop major bleeding but they will help you with direct pressure. Bandages are also good to help immobilise broken bones such as tying a broken leg to the other leg (no need for fancy splints). So, you can get yourself a Trafalgar First Aid Kit then be prepared to modify it. For a list of suggested items, either use this post or check out our modified kit in the store. 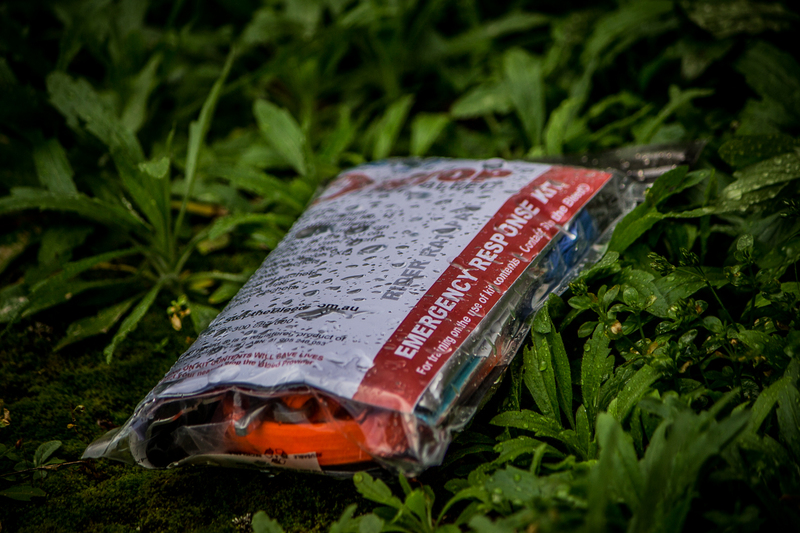 Does your kit need to be waterproof? If yes, you have some options available to you. Firstly, just get yourself a large sandwich bag and put your modified Trafalgar kit inside that and store it somewhere on the bike, problem solved – Or – you get yourself a strong purpose designed waterproof kit. 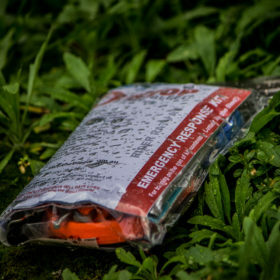 Our NEW ‘RIDER RAT PAK’ comes packaged in a waterproof (to 60 metres) resealable bag. So not only does the RIDER RAT PAK keep all your gear clean and dry, but it allows you to open it up, use what you need and reseal. It doesn’t matter what First Aid Kit you choose if you don’t know how to use what’s inside. 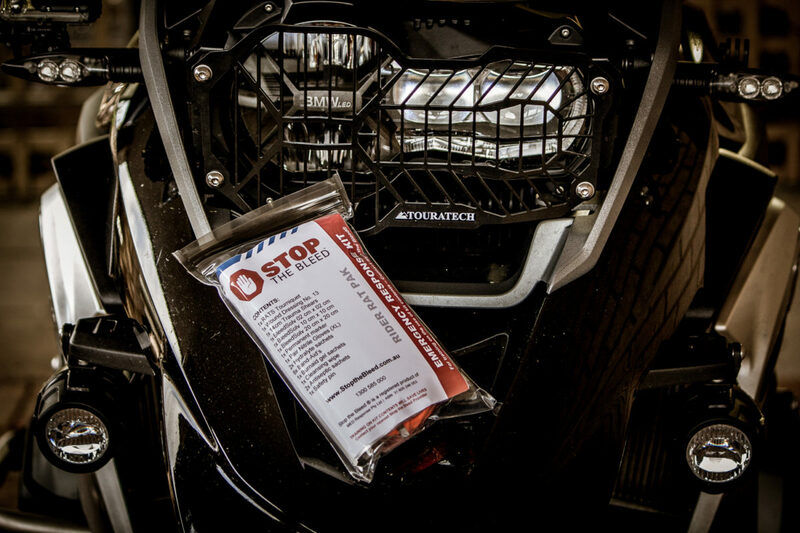 Bottom line – Get yourself a great Motorcyclist First Aid Kit, make sure it has everything you need to Stop the Bleed®, and just as important – get trained in the use of the contents, including haemostatic dressings and tourniquet application. Also make sure that your trainer provides the RIGHT training. When your life is on the line or the life of a mate, it will be your training that will make all the difference – so get that bit right. 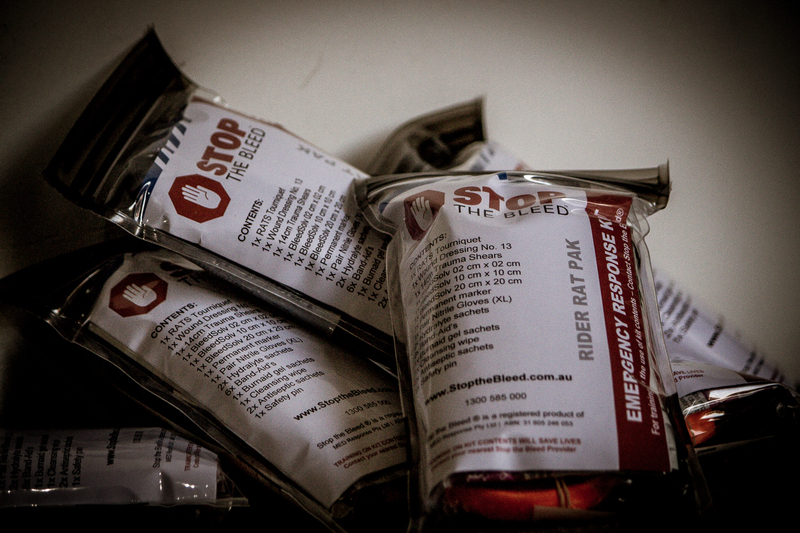 Ask us for a list of authorised STOP THE BLEED® or RIDER DOWN® training providers in your area, or organise a group booking. We are proud to have just released the new RIDER RAT PAK. So why did we select the Rapid Application Tourniquet System (R.A.T.S) as our preferred tourniquet for the RIDER RAT PAK – simple really – Hundreds of motorcyclists selected it. RIDER DOWN – First Aid for the Motorcyclist and our very own STOP THE BLEED program have trained hundreds of people over almost two years on both national and international standards for major bleeding control. Our process it to provide the learner with the advantages and disadvantages of at least 5 tourniquets on the market today including the two ‘combat approved’ tourniquets. Approximately 95% of our students prefer the Rapid Application Tourniquet System (R.A.T.S) for ease of use and how quick it is to stop the bleed. The RIDER RAT PAK is available for purchase on our online store. For all international orders, please contact us first. Founder and CEO, Janine Nicholas is an internationally certified emergency medical service (EMS) provider and educator with experience in Australia, North America and the Middle East. With a career spanning well over 25 years’, she holds numerous instructor, instructor trainer and program development and coordinator qualifications including NAEMT, NAEMSE and Diploma of Training and Education. Prehospital Emergency Care qualifications include (but not limited to) Diploma of Paramedical Science, Tactical Emergency Casualty Care (TECC), and Prehospital Trauma Life Support to name a few. 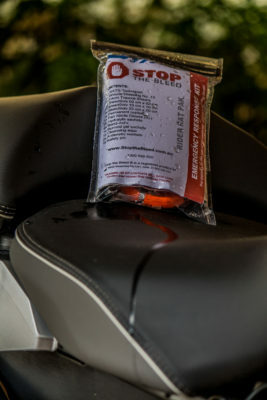 This entry was posted in RIDER DOWN and tagged Fast Aid for Motorcyclists, First Aid for Motorcyclists, First Aid for the Motorcyclist, First Aid Kit, First Aid Kit for Motorcyclists, Rider Down, Stop the Bleed. Hi there Donna – Thanks for asking the question and we will make sure to update our page info. The size of the RIDER RAT PAK measures 18cm high x 11.5cm wide.